Cleaning can be a nightmare if you don’t have the right tools at your disposal. Whether it is all the dust and dirt that accumulates on every open surface in the house or the heaps of pet hair that can be found on your couches and carpets if you own a pet, it can be quite a challenge to get rid of. Living in a dirty house is not an option as such spaces can wreak havoc on your health. It can be especially annoying if you suffer from allergies or have a sensitive nose, but even otherwise, cleaning your living space regularly is the first step in living a healthy life. Then the question arises – “What will make my task easier?” The answer here is quite simple. Invest in a good quality vacuum cleaner! 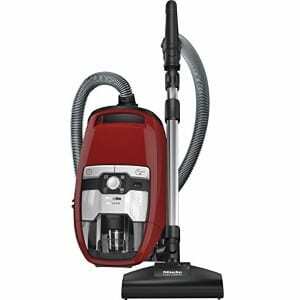 There are many types of vacuum cleaners that are available in the market at any given time. If you live in a relatively smaller home, it may be worth your time to look into cylinder vacuum cleaners, as these are usually smaller and lighter than the regular upright vacuum cleaners, which makes them ideal for use in smaller spaces. Cylinder vacuum cleaners are relatively easier to manoeuvre around your home and also do not give trouble in storage when they aren’t being used. They are versatile and can be used on carpets, hard floors and stairs. They can also reach the harder to clean areas around your house with great ease than regular vacuum cleaners. Are you confused about which one will suit your needs well? Here are the three best cylinder vacuum cleaners in the market right now. The Miele Blizzard CX1 Powerline is probably the best cylinder vacuum money can buy. If you have the money, this is a great investment that will make the task of vacuuming a piece of cake. Designed specifically keeping pet owners in mind, it minimises the hard work that you would otherwise have to put in to remove all the pet hair and dirt from around your house. It comes with a full-size turbo head that makes cleaning easier, joint attachments and wands that can be adjusted according to your height so that manoeuvrability is not an issue. The vacuum cleaner comes with a control dial that can be adjusted to a rug, carpet, hard floor or upholstery setting. However, you will not need to bend down again and again once you choose your setting as the product comes with foot controls for switching it on and off. The main feature of the Miele Blizzard CX1 Cat and Dog Powerline vacuum cleaner is the company’s Cat & Dog floorhead that boasts of a rotating brush bar that is strong enough to pull all the dog fuzz from any surface. The air-powered brush bar comes with twin rows of stiff nylon bristles that are extremely effective when it comes to overall carpet cleaning duties, without any effort on your part. The Blizzard CX1 Cat and Dog Powerline is a powerful machine that comes with four levels of cleaning power that can be controlled through a knob on the top of the vacuum cleaner. Each level is represented with graphics – for curtains or upholstery, rugs, carpets and hard floors. As opposed to the traditional use of replaceable bags to catch dirt in vacuum cleaners, the bagless ones use filters to trap the dirt and debris in a specialized chamber that can be emptied. One of the key features of this vacuum cleaner is the Comfort Clean function. The product has inbuilt smart sensors that measure the amount of dirt being picked up with the help of the Gore CleanStream fine dust filter and automatically activates the Comfort Clean self-cleaning function if it feels the need to. In order for this to happen, the vacuum cleaner turns off for about 20 seconds. This function can also be activated manually for a consistently high cleaning performance. As discussed before, bagless vacuum cleaners come with a specialized chamber where the dust and dirt is collected. The Blizzard CX1 Cat and Dog Powerline’s emptying container comes with a Click2open mechanism that allows the flap to open at a full 180° angle. This means that all the coarse dust and dirt will fall directly into the bin and there will be no fine dust cloud formed. If you do not want to spend too much money on your vacuum cleaner but are still looking for good power, you should consider the Miele Complete C3 PowerLine. As opposed to the bagless Miele Blizzard CX1 Cat and Dog Powerline, the Complete C3 PowerLine is a bagged vacuum cleaner. It is equipped with a sealed casing that will ensure that no dust escapes and that only clean exhaust air is returned to the room while you are vacuuming. The vacuum cleaner boasts of a 12-metre radius, which means that all your worries about changing sockets as you move from one corner to the other can now be put to rest. With a price point that is significantly lesser than other than Miele’s Blizzard CX1 Cat and Dog Powerline, the Complete C3 PowerLine comes with a powerful motor, foot controls and a very effective Allteq floorhead that makes it a decent investment. The Miele Complete C3 PowerLine comes with an extremely potent 900W motor that makes cleaning so much easier. The product comes equipped with great power controls that will allow you to adjust suction to four power levels, without losing out on the cleaning capacity in the middle. The product also comes with foot controls, which means that it can be switched on and off without bending down each time, saving your back a ton of work! The vacuum cleaner is equipped with Miele’s Allteq floorhead, which is one of the most effective non-turbo brush floorheads that are currently present in the market. Great for pulling up all the dirt on varied surfaces, the Allteq floorhead features a pivot and tilt neck, large rear roller – which make it easier to manoeuvre – and a footswitch that drops down bristles for effective cleaning of hard floors. The neck design of this floorhead comes with a clip that fits into either side of the main cleaner making it easy for the whole head, tube and hose of the vacuum cleaner to stand upright. If you lift the concealing top flap, you will also be able to see C3 Powerline’s main tools – the crevice tool, dusting brush and an upholstery head – all of which are solidly build and of a good size. As opposed to the other bagless vacuum cleaner, the Complete C3 PowerLine is equipped with 4.5-litre HyClean GN bags, one of the company’s signature features. These bags have a great a great capacity, combined with the promise of great filtration. The only downside is that the company will supply only one with the vacuum cleaner. In order to prevent any dust from getting back into your room while you clean, the vacuum cleaner comes with two replaceable filters – the first is before the motor and the second is placed after the bag. These are provided with every new pack of Miele HyClean bags, allowing you to change them out whenever you start a new set of bags. How many vacuum cleaners have you come across that will pick themselves back up from the ground after toppling over? My guess is zero. This is where Dyson’s CY26 Cinetic Big Ball Animal 2 will be the exception. This is a specialized vacuum cleaner targeting pet owners who want to get rid of all the hair and fuzz their cats and dogs leave around the house. The Cinetic Big Ball Animal 2 comes with a very powerful motor and a host of floorheads that are designed for different types of floors. The vacuum cleaner is bagless and is one of the easiest ones to empty once the dirt and dust have been collected in the bin designed for holding it. The product remains one of the more expensive options in the category of cylinder vacuum cleaners. Its large number of features, however, make it worth the investment. While the Dyson CY26 Cinetic Big Ball Animal 2 comes with a number of efficient floorheads, the one that makes this vacuum cleaner very popular is the Tangle-free Turbine Tool. Specially engineered for houses that have pets – and the love, hair and dirt associated with them – the turbine head is basically a counter-rotating brush head made up of nylon bristles that works effectively to remove hair from carpets and upholstery. The floorhead does not require a brush bar for it to wrap around and shows great results when used to deal with fuzz from dogs and cats. If any other vacuum cleaners get knocked down to the ground, they will stay like that till you come to physically pick them up and set them up straight. This is where Dyson’s technology brings something different to the table. If you have a Big Ball Animal 2, the vacuum cleaner will not need you to pick it back up. Instead, it is engineered to pick itself up in case it falls down. Dyson’s Big Ball Animal 2 comes with a rotating wand handle that allows for much easier cleaning, even making it easy to clean those hard-to-reach corners for a more effective cleaning process. The wand that comes with the vacuum cleaner has the capacity to rotate in three directions, which allows for a 360° articulation. This means more control over the functioning of the vacuum cleaner with much lesser effort on your part. The Dyson CY26 Cinetic Big Ball Animal 2 has a large capacity bin that allows for more dirt and debris to be collected without the interruption of your cleaning process with the need to empty the bin repeatedly. One of the best features of the vacuum cleaner, however, is the one-click bin-emptying feature that makes cleaning up easy and hygienic. This feature allows you to drive out all the dirt that has been collected by the vacuum cleaner with one push of a single button. This means that you do not have to even touch any of the dirt collected. Going out to buy a vacuum cleaner can be a daunting task, especially because of the sheer number of options that are currently available in the market. The process can be confusing and you can get overwhelmed easily so the best thing to do is gauge your needs before you make your decision. For example, if you’re going in for a cylinder vacuum cleaner as they are smaller and lighter than the bulkier options, you will also have to consider what other features hold great importance for you. By this I mean – do you want a vacuum cleaner that is made specifically keeping in mind pets? Or should it be bagless or a regular bagged one? There are many other categories like this which will need to be discussed before you can make the right decision so here is a buyer’s guide that will walk you through all such questions, making the decision so much easier! The first decision you will have to make is whether you want a more traditional bagged vacuum cleaner or a bagless one. Out of the three options we have discussed before, the Miele Complete C3 PowerLine is the only bagged alternative, while the other two are bagless. The main positive of bagged cylinder vacuum cleaners is that they have a large capacity and collect dust and dirt in a bag, which will have to be disposed of when full and replaced. While some variants of the bagged vacuums seal the dust away for cleaner disposal, some use a powerful cyclone technology to remove bacteria and allergens from the airflow and trap dirt in a chamber – making them ideal for people suffering from asthma or allergies. 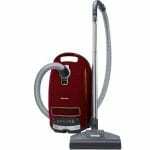 Bagless cylinder vacuum cleaners, on the other hand, are more cost effective and much better for the environment as you don’t have to replace bags. Bags that fill up also reduce the suction power of the vacuum so bagless ones don’t have to deal with such loss of potential. The most important factor that you will need to consider before buying a vacuum cleaner is the technology that has been employed by it. For example, the ‘no loss of suction’ (NLOS) technology that uses multi-cyclonic action to stop the filter from clogging, is one of the best performance wise. This is because it keeps the suction power at its maximum. The Dyson Cinetic models use the cyclone technology, which means that you don’t have to worry about the maintenance of the vacuum’s filter. Another great way to gauge the performance is to check the products rating under the new EU energy legislation that was introduced for all new corded vacuums from September 2014. Ratings are based on performance while picking up dirt from carpets and hard floors and ranges from A to G. The higher the letter, the better is the performance. Another major factor that needs to be considered is the presence of pets in your household. Not only is pet hair tough to remove from carpets and upholstery, but it also leaves some peculiar odours across the house. These are not easy to remove with just any vacuum cleaner. This is where the pet-specific models of vacuum cleaners come in. For example, both the Miele Blizzard CX1 Cat and Dog Powerline and the Dyson CY26 Cinetic Big Ball Animal 2 are specifically designed keeping in mind households that have pets. These models are equipped with high suction power, as well as high-speed brush bars that are able to life hair and fluff from surfaces. While the average vacuum in the cylinder category weighs between 4.3 and 8 kgs, you will have to make your decision based on your needs. Both the Miele vacuum cleaners weight 5.4 kg, which means that they aren’t the lightest, but light enough to be carried around. 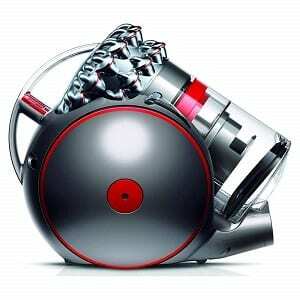 The Dyson vacuum cleaner is about another kilo heavier. The relatively small size of vacuum cleaners makes them easier to move around so that they can be carried to the area that needs to be cleaned, even if it means that you have to climb some stairs to vacuum them. The suction head is usually away from the main unit so that it is easier to reach awkward areas. The length of the cord also affects your cleaning experience as longer ones make it easier to clean large rooms without having to change the socket again and again. The dust capacity of vacuum cleaners – which means the amount of dust it can collect without cleaning the bin – usually ranges from 1 to 4 litres. A larger capacity means that more cleaning can be done before it needs to be emptied, reducing your work in the long run! The Miele Blizzard CX1 Cat and Dog Powerline has a dust capacity of 2 litres and the Dyson variant comes with a 1.6-Litre dust capacity. 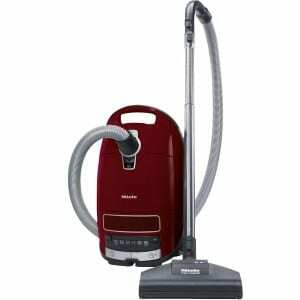 The Miele Complete C3 PowerLine is a bagged vacuum cleaner, therefore it comes with a 4.5-Litre dust capacity. 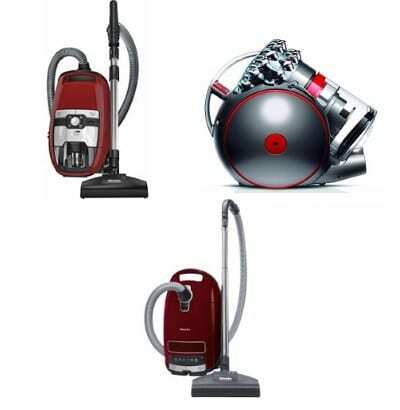 Once you’re through with reading this, you will be equipped with the knowledge of picking up the best cylinder vacuum cleaner for your needs and tastes. Do you want something that is very powerful but also expensive? Are you looking for something on the cheaper side? Do you have pets at home that will be shedding their fur coats all over your expensive couch, carpets or rugs? All of these are questions that you must ask yourself because the ideal vacuum cleaner for you will differ with differences in these answers. The best overall cylinder vacuum cleaner will have to be the Miele Blizzard CX1 Cat and Dog Powerline. While the Blizzard CX1 Cat and Dog Powerline is on the more expensive side of the spectrum, it is still cheaper than the Dyson pet variant. It comes with a strong 1,200-watt motor and can be adjusted to a rug, carpet, hard floor or upholstery setting, depending on what you’re cleaning at that time. The company’s Cat & Dog floorhead is one of the best in its category and makes it super easy to get rid of all the dirt that comes in with having a pet around the house. The special Comfort Clean feature allows for a more thorough cleaning and the best part is that you do not even have to activate it manually! The smart sensors will see how dirty the place is and automatically activate the self-cleaning function! After learning all there is to learn in this realm, it is time for you to go out and buy the vacuum cleaner that checks all your boxes!